Without a doubt, my FAVORITE thing about Christmas is Christmas Cards. I have always loved making them… but I definitley love getting them. I have received quite a few, and I put them all up on my magnet board and I leave them up forever. Ok, I will admit… I don’t care what the card looks like—I like photos. I shouldn’t say I don’t care… I have gotten some really cool cards already this year… so cute… SO fun to open, but I just love seeing my old friends as their kids grow, and as they add kids to their families… I even love the letters that just give you a little tiny glimpse of what has been going on. today I got a whole slew of cards…and we all sat around the kitchen island reading the commentary and looking at the photos… marveling at how everyone has grown and changed… it’s the best. We finished our Christmas cards Friday night, and I put all the ones with for-sure addresses in the mail today. I am waiting to gather a few addresses. I told eric, that if there was nothing else that I accomplish, I HAVE to get the cards done. so it was a team effort. First we printed out all the addresses/return addresses… then eric was the spray-painter… we did some holly mask on transperancy… and used that to make an envelope that I stitched together with the sewing machine… pretty lickety-split really. I wrote a little letter and we did do a family photo… which is a major project. so I am feeling good about that. Good to have something to check off the list. As if the holidays weren’t stressful enough… and the fact that it’s my anniversary and eric’s birthday on the 21st and 22nd respectively… I am leaving tomorrow for philly to do QVC. it’s my first time. i think I am feeling nervous. So, this is just kind of a test run to see how I do. and at first I had this great obscure time of like 2 am or something… when I knew that I could get some experience- see how things work…but feel like the whole country was sleeping! Pretty much like a dress-rehearsal. But as luck would have it, my time got moved to the 12-2pm slot on Wednesday, Dec. 20. That is eastern time by the way…it’s great, but it’s making me feel more nervous! I did spend today watching a couple hours of Lisa Bearson doing her thing on QVC… trying to study how they do stuff. Man, she makes it look so easy! She does a great job… in any event… I am presenting only one little kit. I will be selling Plastic Alphabets… and so I have spent the last few days playing with them and creating a few samples… and it’s been so fun- I haven’t really played with them in a long time, and I was reminded how much I like them. so, if you have QVC, check it out wed from 12-2pm eastern. If nothing more than to get a little laugh! Is Christmas really only a week away!? as a coping mechanism, i got a pedicure today. i am serious. get red polish. feel festive... take a 1/2 hour to relax. I'll be watching Wednesday Heidi --you'll do fabulous --I am sure of it!! Funny thing --I got a pedicure today too -with sparkly red polish and I feel so much more ready for Christmas... in fact, when I took off my socks -I just stared at my toes, and smiled. What a great family picture! 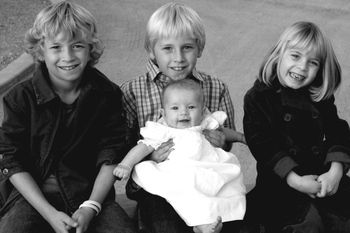 All FOUR of the children looking at the camera and smiling, at that!! The picture in itself is an accomplishment!!!! I only have two girls, and this is the first time I have a great pic of the two of them since Hayley was 8-months old (and she just turned 2)! Ah, a pedicure! Sounds like absolute bliss..wish I had time for that, but I'm not even done with half of my Christmas shopping! Will get to work on that tomorrow. Oh good luck on Wed. Heidi - it'll be fun seeing you on QVC, but you always seem so calm in your video cams, etc. You'll do great. Xmas photo is so cute - that baby Capri's smile lights up a room! Good luck on QVC! You'll do awesome! Can't wait to see you! I am thinking good thoughts for you, Miss Heidi! I'm sure you will be fabulous! I have my tivo set and ready to go! BTW...the Christmas pic turned out great! HEIDI WE WANT TO SEE THE XMAS CARD!!!!! Don't you know by now we crave to see anything you create!! good luck on QVC! can't wait to see you! Good luck on QVC...you will be great. Just pretend you a teaching a class you have done a dozen or more times and you will be fine. I am going for pedi tomorrow...can't wait. Red toes for me too. I will be setting the tivo to be sure I dont miss it! Darlying photo of the kids. Capri is getting so big. Your cards sound lovely. Must feel good to have them almost done. I'll miss the QVC segment - don't have TiVo and and electronically impaired with the recorder. I'm sure you will do fabulously. family. thank you for sharing. I will tune in on wednesday. Cute photo of your kids, little Capri is growing so fast. You have to post your Christmas card after Christmas so we can see it, sounds so cool. cutie cute picture of your kids!! post a picture of your christmas card so we can all see! merry christmas and good luck on qvc, you'll be awesome as always!! I have never ordered anything off of QVC but I will make an exception for you! Also, how do you get the spray paint to stick and not rub off? I end up with silver hands! Good luck on QVC...you're gonna be so cute~ as usual! As for the card thing...I'm with you. Love 'em. Getting them, making them, looking at them over and over. Just so you know, I saved yours from last year and I still like it this year. =) So fun. And I totally understand the hectic schedule this time of year. I've got a bday on the 20th (like I need another excuse for a decadent dessert this time of year!) and kids have been sick and hubby is busy with golf club/holiday parties. I love Christmas, but this year I think I am looking forward to January. I just may have to get my first pedicure ever. I keep saying that, but seriously, I think I deserve it this time! Merry Christmas to you and yours. Wish Emily Waters a Merry one too! please, please, can you share your card and the envelope too!! I would love more info on the envelope. That sounds so cool. Your card sounds fantastic. I love getting cards in the mail too. I enjoy seeing all the deifferent styles and how peoples work progresses from year to year! Good luck at QVC! I'll be watching. Remember that the presentation will probably go really fast -- like 2 minutes. Don't forget to tell what is in the kit. Lisa always does that and the hosts really like that because they don't have to remind you. If your demo boards have glare, you may do a better job presenting at the demo table. Relax, take a deep breath. Can't wait to see what you are bringing. As a viewer, I love to see product demos, how they are used and interesting product ideas. You may even get to take a viewer call! Hope to see you more on the 'Q' in the future. Good luck on QVC, you'll do great! And love that adorable picture of your kids! OOOOh, i'll be looking for you on QVC!! good luck! And the pedicure thing. OH.SO.GOOD! Can't wait to see you tomorrow on QVC! Sounds like the holiday season is going well for you. Your children are beautiful! Have a great day and a Merry Christmas! What a beautiful family photo! I wish we got QVC here in New Zealand...good luck! Hope you and your family have a wonderful christmas and I so look forward to doing your BPS class in the new year..bring it on!